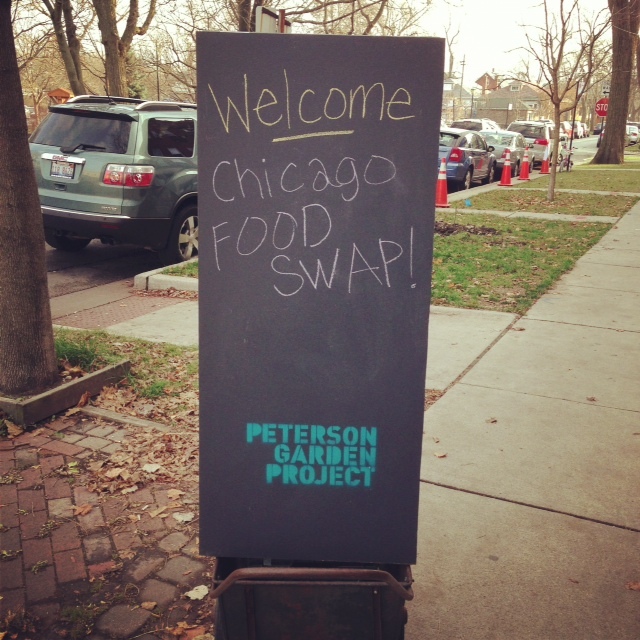 Last Sunday, December 2, the Chicago Food Swap marked its first anniversary by holding — what else? — its biggest ever food swap. Our host for the event was the Peterson Garden Project, a local community gardening organization dedicated to teaching Chicago residents how to grow their own food. Peterson Garden Project has multiples sites all over the north side of the city and welcomes new gardeners, so if you are interested in learning more about gardening or supporting the cause, definitely check it out. Chef Druck and I both felt that the mission of Peterson Garden Project dovetailed perfectly with the mission of the Chicago Food Swap. The folks at PGP want Chicagoans to grow their own food; we want them to make their own food and then trade it with other Chicagoans! The point is, it is all about building community around food. So, we are very grateful to Peterson Garden Project for opening their doors to us. Thank heavens for global warming! By some miracle, it was in the 60′s in Chicago in early December. That meant that we were able to use not only Peterson Garden project’s beautiful education space, located in Chicago’s Ravenswood Manor neighborhood, but also the space’s lovely backyard for Sunday’s swap. And we needed every inch of space! With 45 registered swappers, the tables were packed. One day, we will learn that however many tables we think we need, we actually need way more. This was our biggest swap ever and such a terrific reminder of how far we have come in the past year. From our first Swap, which had maybe 10 people and was held in the basement of a local boutique, to Sunday’s three-room, 45-person extravaganza is quite a journey in one year. We have some swappers who have joined us four or five swaps and then there are always newcomers who are there for the first time. But, the newcomers quickly become veterans because it is just that much fun.I swear to you that everyone leaves vowing to come back next time. Chef Druck and I are constantly amazed by the outpouring of creativity and inspiration from the swappers. The diversity of the offerings at these events astound me. Sure, there are always baked goods and jam, as you might expect. But there is also plenty of exciting things that are unfamiliar. For example, one swapper, Dora, brings a drink syrup that she makes from dried sorrel flowers that her Jamaican in-laws grow on their farm in rural Florida. I had never heard of sorrel flowers before, but once I tried Dora’s syrup, I knew I wanted some. I also love how swappers bring their cultures and backgrounds to their offerings. One of our swappers who is Irish brought the prettiest Irish brown bread I have ever seen and another swapper who is Polish brought homemade Polish farmers cheese. (I missed out on Anna’s bread but was able to score some of the cheese.) Of course, some of the items are so much unfamiliar as simply hard to find. One of the hottest items this time and last were fresh eggs from a swapper who has her own backyard chickens. And as the swaps get bigger and bigger, there is truly something for everyone. I chatted with one first-time swapper at Sunday’s event who is gluten-free. 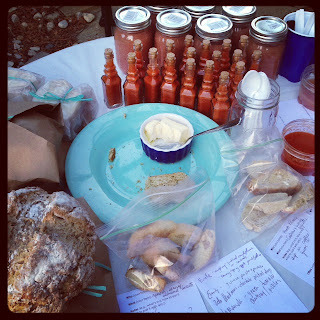 She was able to find plenty of delicious items to swap for that met her restrictions, from drink syrups to jams to pickles and mustard. Many of the items I saw on Sunday were dairy-free and even vegan. But, don’t fret! If you are looking for decadent desserts, you will find plenty of that too. I came home with some walnut chocolate toffee that is the stuff dreams are made of and I sadly missed out on the little chocolate cakes that were a hot item. 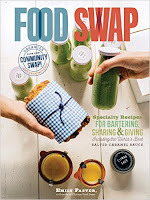 Whether you want homemade vanilla extract or hot sauce to cook with for the coming weeks, or a decadent treat to eat that night, it is all at the Chicago Food Swap. My swap items will keep me eating and cooking for weeks. The growing size of our events is definitely giving us some challenges. At Sunday’s Swap, for example, it was so big and spread out, that it was sometimes hard to find the person who had made an offer on your item, despite the ubiquitous name tags. One of our veteran swappers, Melisa, suggested numbering the tables to make it easier to find trading partners. When we only had 12 or even 20 people, that was not simply not an issue. But once you approach 50 swappers, which we did, we realize that we have to start changing how we do things. But the important thing is, even as the swaps have grown in size, we have never lost the community spirit or the sense of fun. We trade so much more than food at these events. The real magic of these events is finding that community of like-minded people who care about delicious food and making it themselves as much as you do. The bigger we grow, the more inspiring it is to realize how big the community of food-lovers really is. Will you join us at our next swap on February 3? 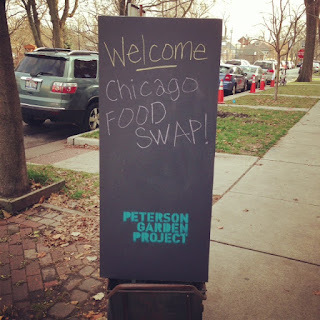 Or, if you are not local to Chicago, have you looked into a food swap in your area?